The Gaslight Gathering, Southern California’s dedicated Steampunk and Neo-Victorian Convention returns to San Diego. 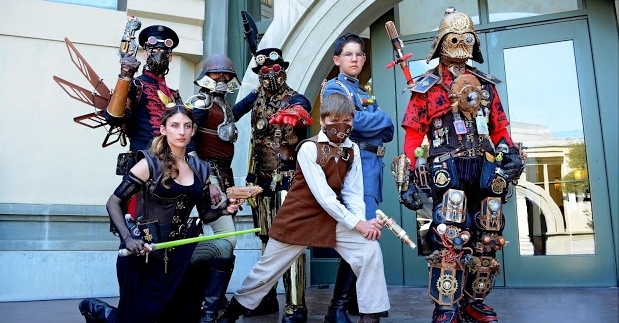 Enter the world of Steampunk with costumes and accessories from Etoile Costume & Party Center. For the uninitiated, Steampunk is a subgenre of science fiction. It blends the Victorian era with the future and explores imagined technologies, such as weapons powered by steam and computers that run on clock gears. It’s also very much about elaborate costumes that range from corsets and skirts to futuristic cowboys. The ideas of Jules Verne, author of “Around the World in Eighty Days” are most prominent in the Steampunk genre. People carry oversized travel bags, imaginative weapons and wear aviation goggles. Other influences include H.G. Wells, Charles Dickens and most importantly, the Industrial Revolution. There’s even a touch of Edward Gorey in the Steampunk realm. 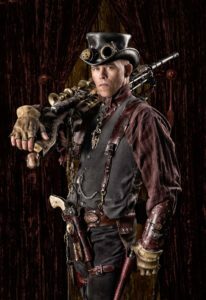 RULE 1: Steampunk fashion is a real-world reproduction of the clothing that is or could be found in Steampunk literature. It’s that simple. RULE 2: When in doubt, dress Victorian and then add. The Victorians were the first people to fully capitalize on steam technology in a way that affected everyday life, so it is no surprise that most Steampunk writing either takes place in the Victorian world or is strongly inspired by it. If you’re afraid that your outfit is “too Victorian” you’re probably doing it right. simply because you fear it will be “not Steampunk enough.” Do not be misled, coerced, or second-guessed into including a collection of “Steampunk status symbols” (goggles are the most infamous, though we do love them) if they do not fit with the outfit, or with the vision you are attempting to produce. RULE 4: There is no “Steampunk color.” Some people have claimed that Steampunk is only brown, or only black, or only white, or only light, or only dark. They are wrong. Virtually any color can be Steampunk (though perhaps one might balk at neon). Remember, Steampunk is set in a world of comparatively advanced technology, so it is perfectly reasonable to have vibrant colors and complicated machine-made patterns. RULE 5: You are allowed to like other genres. If you like a style of fashion that does not fit into Steampunk (Enlightenment era, Pulp Adventure, Mod 60s, Medieval, etc.) be proud of it. Do not feel compelled to try and wedge it under the Steampunk caption. These are all genres that people have worked very hard to create, expand, and explore; so we rather owe it to them to respect the diversity and uniqueness of their differences. We are all diverse and well-rounded people with differing interests. Let that be a source of pride. RULE 6: Have fun and be yourself. That’s what this is about. Don’t feel compelled to conform with everyone else. You have a unique style. OWN IT! 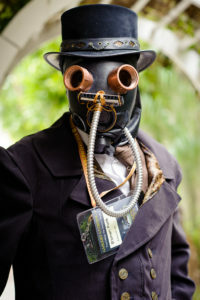 San Diego is again hosting the Gaslight Gathering, Southern California’s only Steampunk/Victoriana convention. Check out the website for the Gaslight Gathering (just click on the official logo below), and don’t forget to come by Etoile Costume & Party Center for costumes and accessories. We have goggles, jewelry, corsets, skirts, petticoats, jackets and hats for ladies and goggles, monocles, pocket watches, pants, jackets, shirts, ascots and hats for the gents. We are all so fortunate that the sponsors of the Gaslight Gathering Convention bring us the very best Guests of Honor, presenters, instructors, performers, vendors, and volunteers to make our experience at Gaslight one of the best events in Southern California every year. We are located at 18849 Ventura Boulevard, between Reseda Boulevard and Tampa Avenue, in Tarzana; a San Fernando Valley suburb of Los Angeles. Our customers come from as far away as Santa Clarita to the north, Orange County to the south, Pasadena to the East and Westlake Village and Ventura to the West…and everywhere in between.